Yet another tool to create the *.png images required by Firemonkey iOS and Android application splash images. The sample project uses an FMX 3D form containing a sample “logo”. This can be replaced to use a normal image instead. Using a 3D form might produce better output quality as texts and graphics are regenerated from vector data every time for each icon dimension, instead of stretching a single “big” bitmap. The *.ico file for Windows projects is created containing a single image. 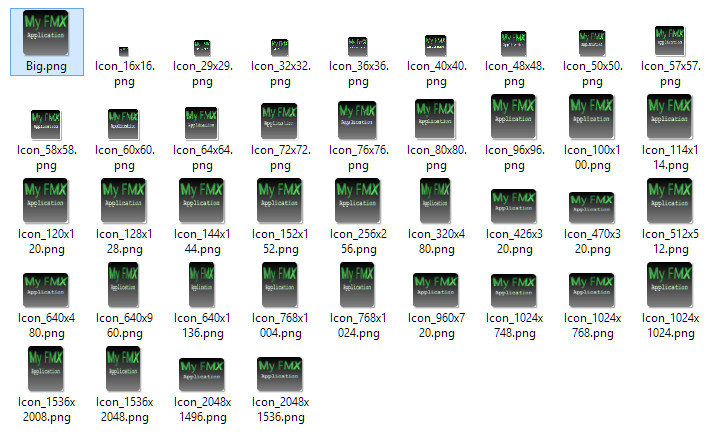 You can use Gimp or IcoFX to create a multiple ico file using the generated *.png images. This code has some shortcomings. Could be used to make easier. By the way, does it work? I’ll have to check.